I am a big Jennifer Aniston fan and I love all her movies and shows. With all her movies, this is one of my favorites. 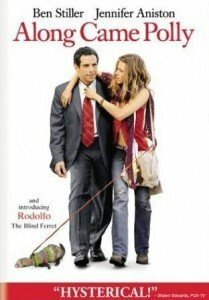 Along Came Polly was released back in 2004 and it’s a romantic comedy starring Jennifer Aniston and Ben Stiller. The title is perfect for this movie since Ben’s character Reuben had a terrible experience with his wife on their honeymoon when he saw her sleeping with their diving instructor. He then met Polly who was his school friend. They immediately felt a connection with each other although the two are the complete opposite of each other. Reuben is afraid to take risks and doesn’t like germs a lot while Polly is a waitress who is not ready to settle down and get married and lives with her blind ferret. Reuben’s wife came back in the end and wanted to make amends but Reuben decided to take the risk and live a miserable life with Polly than go back to his unfaithful wife and live normally. Eventually Polly and Reuben got married and went back to the same place where Reuben and his former wife had a honeymoon. There he met the guy that stole his wife. Instead of being mad, he thanked him because now he found the right woman for her. That part is one of my favorite really as it shows how this man really loves Polly that despite what he experienced in the past, he is thankful because it led him to her.